PowerPC (an acronym for Performance Optimization With Enhanced RISC – Performance Computing, sometimes abbreviated as PPC) is a RISC instruction set architecture created by the 1991 Apple–IBM–Motorola alliance, known as AIM. PowerPC, as an evolving instruction set, has since 2006 been renamed Power ISA but lives on as a legacy trademark for some implementations of Power Architecture based processors. Originally intended for personal computers, PowerPC CPUs have since become popular as embedded and high-performance processors. PowerPC was the cornerstone of AIM's PReP and Common Hardware Reference Platform initiatives in the 1990s and while the architecture is well known for being used by Apple's Macintosh lines from 1994 to 2006 (before Apple's transition to Intel), its use in video game consoles and embedded applications provided an array of uses. PowerPC is largely based on IBM's earlier POWER instruction set architecture, and retains a high level of compatibility with it; the architectures have remained close enough that the same programs and operating systems will run on both if some care is taken in preparation; newer chips in the POWER series implement the full PowerPC instruction set. The history of RISC began with IBM's 801 research project, on which John Cocke was the lead developer, where he developed the concepts of RISC in 1975-78. 801-based microprocessors were used in a number of IBM embedded products, eventually becoming the 16-register ROMP processor used in the IBM RT. The RT was a rapid design implementing the RISC principles, and the performance was disappointing in comparison to the high performance 68000 microprocessor from Motorola. Between the years of 1982-1984 IBM started a project to build the fastest microprocessor on the market; this new 64-bit architecture became referred to as the "America Project" throughout its development cycle which lasted for approximately 5–6 years. The result was the POWER instruction set architecture, introduced with the RISC System/6000 in early 1990. The original POWER microprocessor, one of the first superscalar RISC implementations, was a high performance, multi-chip design. IBM soon realized that a single-chip microprocessor was needed in order to scale its RS/6000 line from lower-end to high-end machines. Work on a one-chip POWER microprocessor, designated the RSC (RISC Single Chip) began. In early 1991, IBM realized its design could potentially become a high-volume microprocessor used across the industry. IBM approached Apple with the goal of collaborating on the development of a family of single-chip microprocessors based on the POWER architecture. Soon after, Apple, being one of Motorola's largest customers of desktop-class microprocessors, asked Motorola to join the discussions due to their long relationship, its more extensive experience with manufacturing high-volume microprocessors than IBM, and to form a second source for the microprocessors. This three-way collaboration became known as AIM alliance, for Apple, IBM, Motorola. In 1991, the PowerPC was just one facet of a larger alliance among these three companies. At the time, most of the personal computer industry was shipping systems based on the Intel 80386 and 80486 chips, which had a CISC architecture, and development of the Pentium processor was well underway. The PowerPC chip was one of several joint ventures involving the three, in their efforts to counter the growing Microsoft-Intel dominance of personal computing. For Motorola, POWER looked like an unbelievable deal. It allowed them to sell a widely tested and powerful RISC CPU for little design cash on their own part. It also maintained ties with an important customer, Apple, and seemed to offer the possibility of adding IBM too, who might buy smaller versions from Motorola instead of making its own. At this point Motorola already had its own RISC design in the form of the 88000 which was doing poorly in the market. Motorola was doing well with their 68000 family and the majority of the funding was focused on this. The 88000 effort was somewhat starved for resources. However, the 88000 was already in production; Data General was shipping 88k machines and Apple already had 88k prototype machines running. The 88000 had also achieved a number of embedded design wins in telecom applications. If the new POWER one-chip version could be made bus-compatible at a hardware level with the 88000, that would allow both Apple and Motorola to bring machines to market far faster since they would not have to redesign their board architecture. The result of these various requirements was the PowerPC (Performance Computing) specification. The differences between the earlier POWER instruction set and PowerPC is outlined in Appendix E of the manual for PowerPC ISA v.2.02. When the first PowerPC products reached the market, they were met with enthusiasm. In addition to Apple, both IBM and the Motorola Computer Group offered systems built around the processors. Microsoft released Windows NT 3.51 for the architecture, which was used in Motorola's PowerPC servers, and Sun Microsystems offered a version of its Solaris OS. IBM ported its AIX Unix and planned a release of OS/2. Throughout the mid-1990s, PowerPC processors achieved benchmark test scores that matched or exceeded those of the fastest x86 CPUs. Ultimately, demand for the new architecture on the desktop never truly materialized. Windows, OS/2 and Sun customers, faced with the lack of application software for the PowerPC, almost universally ignored the chip. The PowerPC versions of Solaris, OS/2, and Windows were discontinued after only a brief period on the market. Only on the Macintosh, due to Apple's persistence, did the PowerPC gain traction. To Apple, the performance of the PowerPC was a bright spot in the face of increased competition from Windows 95 and Windows NT-based PCs. In parallel with the alliance between IBM and Motorola, both companies had development efforts underway internally. The PowerQUICC line was the result of this work inside Motorola. The 4xx series of embedded processors was underway inside IBM. The IBM embedded processor business grew to nearly 100 million dollars in revenue and attracted hundreds of customers. However, toward the close of the decade, manufacturing issues began plaguing the AIM alliance in much the same way they did Motorola, which consistently pushed back deployments of new processors for Apple and other vendors: first from Motorola in the 1990s with the G3 and G4 processors, and IBM with the 64-bit G5 processor in 2003. In 2004, Motorola exited the chip manufacturing business by spinning off its semiconductor business as an independent company called Freescale Semiconductor. 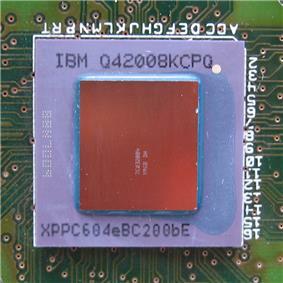 Around the same time, IBM exited the 32-bit embedded processor market by selling its line of PowerPC products to Applied Micro Circuits Corporation (AMCC) and focusing on 64-bit chip designs, while maintaining its commitment of PowerPC CPUs toward game machine makers such as Nintendo's GameCube and Wii, Sony's PlayStation 3 and Microsoft's Xbox 360, of which the latter two both use 64-bit processors. In 2005 Apple announced they would no longer use PowerPC processors in their Apple Macintosh computers, favoring Intel-produced processors instead, citing the performance limitations of the chip for future personal computer hardware specifically related to heat generation and energy usage, as well as the inability of IBM to move the 970 (PowerPC G5) processor to the 3 GHz range. The IBM-Freescale alliance was replaced by an open standards body called Power.org. Power.org operates under the governance of the IEEE with IBM continuing to use and evolve the PowerPC processor on game consoles and Freescale Semiconductor focusing solely on embedded devices. IBM continues to develop PowerPC microprocessor cores for use in their application-specific integrated circuit (ASIC) offerings. Many high volume applications embed PowerPC cores. By July 2010, the POWER architecture IBM developed is still very much alive on their server offerings for large businesses and continues to evolve (and current POWER processors implement the full PowerPC instruction set architecture). For example, IBM's servers based on POWER have the highest revenue marketshare (53.9%) among UNIX servers. 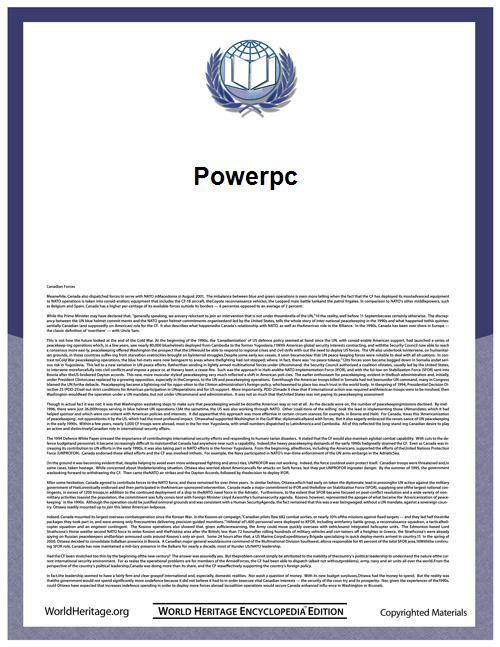 The PowerPC specification is now handled by Power.org where IBM, Freescale, and AMCC are members. PowerPC, Cell and POWER processors are now jointly marketed as the Power Architecture. Power.org released a unified ISA, combining POWER and PowerPC ISAs into the new Power ISA v.2.03 specification and a new reference platform for servers called PAPR (Power Architecture Platform Reference). Support for operation in both big-endian and little-endian modes; the PowerPC can switch from one mode to the other at run-time (see below). This feature is not supported in the PowerPC 970. This was the reason Virtual PC took so long to be made functional on 970-based Macintosh computers. A paged memory management architecture which is used extensively in server and PC systems. Addition of a new memory management architecture called Book-E, replacing the conventional paged memory management architecture for embedded applications. Book-E is application software compatible with existing PowerPC implementations, but needs minor changes to the operating system. Most PowerPC chips switch endianness via a bit in the MSR (Machine State Register), with a second bit provided to allow the OS to run with a different endianness. Accesses to the "inverted page table" (a hash table that functions as a TLB with off-chip storage) are always done in big-endian mode. The processor starts in big-endian mode. In little-endian mode, the three lowest-order bits of the effective address are exclusive-ORed with a three bit value selected by the length of the operand. This is enough to appear fully little-endian to normal software. An operating system will see a warped view of the world when it accesses external chips such as video and network hardware. Fixing this warped view requires that the motherboard perform an unconditional 64-bit byte swap on all data entering or leaving the processor. Endianness thus becomes a property of the motherboard. An OS that operates in little-endian mode on a big-endian motherboard must both swap bytes and undo the exclusive-OR when accessing little-endian chips. AltiVec operations, despite being 128-bit, are treated as if they were 64-bit. This allows for compatibility with little-endian motherboards that were designed prior to AltiVec. An interesting side effect of this implementation is that a program can store a 64-bit value (the longest operand format) to memory while in one endian mode, switch modes, and read back the same 64-bit value without seeing a change of byte order. This will not be the case if the motherboard is switched at the same time. Mercury Computer Systems and Matrox ran the PowerPC in little-endian mode. This was done so that PowerPC devices serving as co-processors on PCI boards could share data structures with host computers based on x86. Both PCI and x86 are little-endian. Solaris and Windows NT for PowerPC also ran the processor in little-endian mode. Some of IBM's embedded PowerPC chips use a per-page endianness bit. None of the previous applies to them. The first implementation of the architecture was the PowerPC 601, released in 1992, based on the RSC, implementing a hybrid of the POWER1 and PowerPC instructions. This allowed the chip to be used by IBM in their existing POWER1-based platforms, although it also meant some slight pain when switching to the 2nd generation "pure" PowerPC designs. Apple continued work on a new line of Macintosh computers based on the chip, and eventually released them as the 601-based Power Macintosh on March 14, 1994. IBM also had a full line of PowerPC based desktops built and ready to ship; unfortunately, the operating system which IBM had intended to run on these desktops—Microsoft Windows NT—was not complete by early 1993, when the machines were ready for marketing. Accordingly, and further because IBM had developed animosity toward Microsoft, IBM decided to rewrite OS/2 for the PowerPC. It took IBM two years to rewrite OS/2 for PowerPC, and by the time the operating system was ready, the market for OS/2 on PowerPC had evaporated. For this reason, the IBM PowerPC desktops did not ship, although the reference design (codenamed Sandalbow) based on the PowerPC 601 CPU was released as an RS/6000 model (Byte′s April 1994 issue included an extensive article about the Apple and IBM PowerPC desktops). Apple, which also lacked a PowerPC based OS, took a different route. They rewrote the essential pieces of their Mac OS operating system for the PowerPC architecture, and further wrote a 680x0 emulator that could run 68k based applications and the parts of the OS that had not been rewritten. The second generation was "pure" and included the "low end" PowerPC 603 and "high end" PowerPC 604. The 603 is notable due to its very low cost and power consumption. This was a deliberate design goal on Motorola's part, who used the 603 project to build the basic core for all future generations of PPC chips. Apple tried to use the 603 in a new laptop design but was unable to due to the small 8 KiB level 1 cache. The 68000 emulator in the Mac OS could not fit in 8 KiB and thus slowed the computer drastically. The 603e solved this problem by having a 16 KiB L1 cache which allowed the emulator to run efficiently. In 1993, developers at IBM's Essex Junction, Burlington, Vermont facility started to work on a version of the PowerPC that would support the Intel x86 instruction set directly on the CPU. 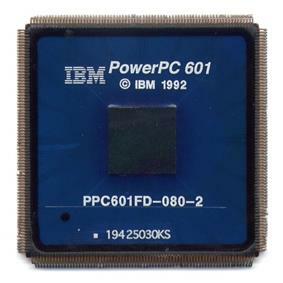 While this was just one of several concurrent power architecture projects that IBM was working on, this chip began to be known inside IBM and by the media as the PowerPC 615. However, profitability concerns and rumors of performance issues in the switching between the x86 and native PowerPC instruction sets resulted in the project being canceled in 1995 after only a limited number of chips were produced for in-house testing. Despite the rumors, the switching process took only 5 cycles, or the amount of time needed for the processor to empty its instruction pipeline. 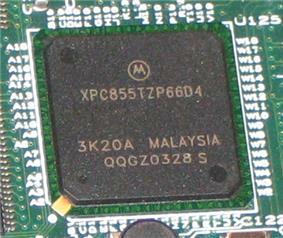 Microsoft also aided the processor's demise by refusing to support the PowerPC mode. The first 64-bit implementation was the PowerPC 620, but it appears to have seen little use because Apple didn't want to buy it and because, with its large die area, it was too costly for the embedded market. It was later and slower than promised, and IBM used their own POWER3 design instead, offering no 64-bit "small" version until the late-2002 introduction of the PowerPC 970. The 970 is a 64-bit processor derived from the POWER4 server processor. To create it, the POWER4 core was modified to be backward-compatible with 32-bit PowerPC processors, and a vector unit (similar to the AltiVec extensions in Motorola's 74xx series) was added. IBM's RS64 processors are a family of chips implementing the "Amazon" variant of the PowerPC architecture. These processors are used in the RS/6000 and AS/400 computer families; the Amazon architecture includes proprietary extensions used by AS/400. The POWER4 and later POWER processors implement the Amazon architecture and replaced the RS64 chips in the RS/6000 and AS/400 families. IBM developed a separate product line called the "4xx" line focused on the embedded market. These designs included the 401, 403, 405, 440, and 460. In 2004, IBM sold their 4xx product line to Applied Micro Circuits Corporation (AMCC). AMCC continues to develop new high performance products, partly based on IBM's technology, along with technology that was developed within AMCC. These products focus on a variety of applications including networking, wireless, storage, printing/imaging and industrial automation. Numerically, the PowerPC is mostly found in controllers in cars. For the automotive market, Freescale Semiconductor initially offered a large number of variations called the MPC5xx family such as the MPC555, built on a variation of the 601 core called the 8xx and designed in Israel by MSIL (Motorola Silicon Israel Limited). The 601 core is single issue, meaning it can only issue one instruction in a clock cycle. To this they add various bits of custom hardware, to allow for I/O on the one chip. In 2004, the next-generation four-digit 55xx devices were launched for the automotive market. These use the newer e200 series of PowerPC cores. Networking is another area where embedded PowerPC processors are found in large numbers. MSIL took the QUICC engine from the MC68302 and made the PowerQUICC MPC860. This was a very famous processor used in many Cisco edge routers in the late 1990s. Variants of the PowerQUICC include the MPC850, and the MPC823/MPC823e. All variants include a separate RISC microengine called the CPM that offloads communications processing tasks from the central processor and has functions for DMA. The follow-on chip from this family, the MPC8260, has a 603e-based core and a different CPM. Honda also uses PowerPC processors for ASIMO. In 2003, BAE SYSTEMS Platform Solutions delivered the Vehicle-Management Computer for the F-35 fighter jet. This platform consists of dual PowerPCs made by Freescale in a triple redundant setup. Operating systems that work on the PowerPC architecture are generally divided into those which are oriented toward the general-purpose PowerPC systems, and those oriented toward the embedded PowerPC systems. Fedora with 32/64-bit ppc releases up to version 12. PowerPC is a Fedora secondary architecture from Fedora 16 onwards. OpenSUSE, Full support for Old World and New World PowerMacs (32/64-bit), PS3 Cell, IBM POWER systems through the release of 11.1. Support was dropped from subsequent releases. ^ "Tech Files Columns, 1987-1990". ^ "Microsoft killed the PowerPC 615". The Register. October 1, 1998. Retrieved August 16, 2009. ^ "Latest robots fill helper, entertainer roles". EETimes.com. Retrieved August 16, 2009. ^ "Lockheed Martin F-35 Press Release" (Press release). Lockheedmartin.com. May 16, 2003. Retrieved August 16, 2009. ^ "FreeBSD/ppc Project". Freebsd.org. Retrieved August 16, 2009. ^ "NetBSD/ofppc". Netbsd.org. Retrieved August 16, 2009. ^ "NetBSD/macppc". Netbsd.org. Retrieved August 16, 2009. ^ "NetBSD/evbppc". Netbsd.org. Retrieved August 16, 2009. ^ "NetBSD/pmppc". Netbsd.org. Retrieved August 16, 2009. ^ "NetBSD/mvmeppc". Netbsd.org. February 27, 2002. Retrieved August 16, 2009. ^ "NetBSD/bebox". Netbsd.org. Retrieved August 16, 2009. ^ "NetBSD/amigappc". Netbsd.org. Retrieved August 16, 2009. ^ "OpenBSD/macppc". Openbsd.org. Retrieved August 16, 2009. ^ "CRUX PPC GNU/Linux Project". Cruxppc.org. Retrieved August 16, 2009. ^ "PowerPC Port". Debian. Retrieved August 16, 2009. ^ "Debian PPC64 Port". Debian. Retrieved July 4, 2012. ^ "Installable Live CD". Fedora Project. Retrieved August 16, 2009. ^ "Gentoo Linux PowerPC Development". Gentoo.org. Retrieved August 16, 2009. ^ "Gentoo Linux PPC64 Development". Gentoo.org. Retrieved July 4, 2012. ^ "MintPPC". Retrieved October 3, 2010. ^ "PowerPCFAQ - Ubuntu Wiki". Wiki.ubuntu.com. Retrieved August 16, 2009. ^ "Embedded Solaris on PowerPC". Research.sun.com. June 14, 2006. Archived from the original on August 7, 2011. Retrieved August 16, 2009. ^ "Solaris PowerPC Port at OpenSolaris.org". Opensolaris.org. October 2, 2006. Archived from the original on August 7, 2011. Retrieved August 16, 2009. ^ a b c "POWER To The People". IBM. March 30, 2004. Archived from the original on 2013-02-04. May, Cathy; et al. (1994). The PowerPC Architecture: A Specification for A New Family of RISC Processors (2nd ed.). Morgan Kaufmann Publishers. Hoxey, Steve (editor) et al. The PowerPC Compiler Writer's Guide. Warthman Associates. ISBN 0-9649654-0-2. Motorola. Programming Environments Manual for 32-bit Implementations of the PowerPC Architecture, a 640 page PDF manual. P/N MPCFPE32B/AD. Duntemann, Jeff; Pronk, Ron (1994). Inside the PowerPC Revolution. Coriolis Group Books.